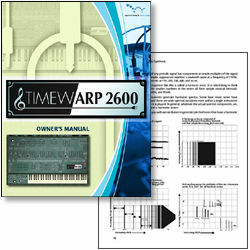 he TimewARP 2600 Manual is free and full of information about our product and how to use it. Even better, the TimewARP 2600 Manual contains an entire chapter on audio synthesis basics written by Jim Michmerhuizen, the author of the original ARP 2600 Manual and Founder and Director of the Boston School of Electronic Music. Essential reading for anyone interested in the vocabulary and methods of classical analog synthesis.